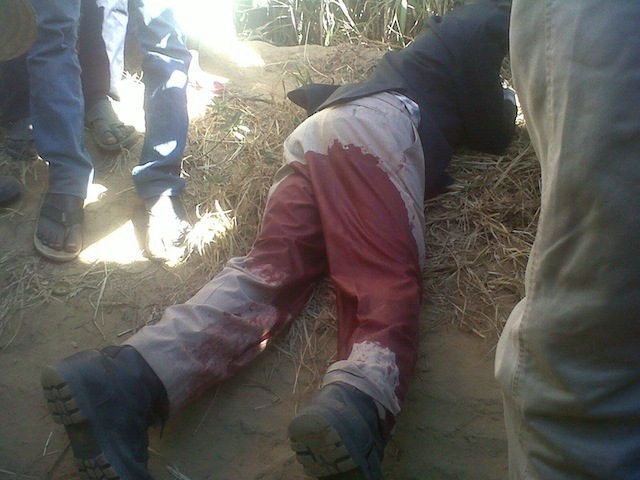 Two Lusaka’s Kapasa Township residents have been shot dead by Zambia National services (ZNS) officers over the land impasse. The settlers have been insisting that the land belongs to them and not ZNS. Some say they have lived there for more than 25 years. Barely two months ago, the USA Human Rights Report on Zambia detailed extra-judicial killings by the Zambia armed forces in the year 2012. The PF regime rejected the reports through their Justice minister Wynter Kabimba. In the Kapasa killings, a third person was injured in the fracas which lasted for over three hours yesterday and was admitted to Levy Mwanawasa Hospital where he is battling for his life after sustaining a gunshot wound on his left leg. The victims, who have been identified as Clement Muloongo and Pumulo Lungwangwa, were hit with short batons before they were shot at close range, according to reports. One was shot in the head and the other in the chest. According to eyewitnesses, one of the men raised his hands and begged the officers armed with AK 47 rifles to spare his life but they ignored him and opened fire on him. But when contacted for a comment, acting police spokesperson Charity Chanda said she had scanty information regarding the shooting incidence but was still waiting for more details. “I have received information by officers who rushed there this morning but I am still waiting for more information. Right now I only have scanty information,” she said. Another witness told the reporter that the armed officers visited the area around 05:00 hours accusing them of refusing to vacate the premises on several occasions even when they were aware that the land they were occupying belonged to ZNS. They said it was at that point that others started resisting and confusion erupted in the processforcing the alleged officers to start shooting which lead to the death of the deceased two men and wounding of the other. “We are shaken. This is our land we have stayed here for years, now if they remove us from here where are we going to go because our children do not know any other place other than this one,” they complained. The residents had since called on the police to ensure that the culprits were brought to book because they had killed innocent people who were fighting for what belonged to them and their rights to shelter. “There was no protest for the officers to open fire at us, we were just arguing because it wasonly this week when we were being assured by higher authorities that we will not be moved so we were shocked to see officers demanding that we be moved claiming we were occupying illegal land, we have been over 10 years,” they said. But some of the officers found at the scene claimed the residents became unruly and started throwing stones at them a situation which led to others to open fire at them in a bid to stop them from throwing stones. A ZNS officer only identified as P M Solochi, who was sent to gather facts about the incident in Kampasa, defended the officers saying they shot at the people in self-defence. He alleged that the settlers were not co-operative and some even threw stones at the officers. Many houses, including a Church of God centre and Patriotic Front (PF) office, were damaged during the operation by ZNS officers, who also allegedly threatened to burn the settlers’ maize. A 54-year-old widow, Elina Ng’andu, who burst into tears, said she had nowhere to go after her house was demolished. Ms Ng’andu and other settlers were found picking up their belongings to camp by the roadside. Some local people said they were surprised that ZNS officers demolished and damaged their houses despite assurances from “some authorities” that their houses would not be touched. The second victim was shot when he tried to rescue his father, who was in the house which was being demolished, while the survivor was shot in the buttocks as he hung around after being evicted from his house. Lungwangwa’s wife, Harriet Shabantu, said her husband was not confrontational when the officers ordered them to vacate the house. “I just told my husband that we should secure our documents and National Registration Cards and leave the house to be demolished. We went to the roadside but they followed us….we moved somewhere else and they still followed us and started beating us up. They started shooting and that is how my husband was shot,” she said.